Sealaska Heritage Institute (SHI) will sponsor its first education conference for teachers and administrators in an effort to promote culturally responsive pedagogy in schools. 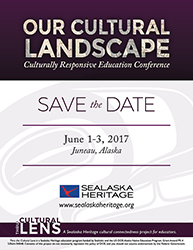 The event, Our Cultural Landscape: Culturally Responsive Education Conference, is scheduled June 1-3 in Juneau. The conference is part of SHI’s Through the Cultural Lens program, which sponsors cultural orientations for educators in the Juneau School District. The conference will include multiple topics, breakout sessions and keynote speakers, and will be organized around three major strands: K-12 Teaching and Learning, which will explore culturally mediated instruction and cultural responsiveness in educational organizations; Early Childhood, which will include discussion of early childhood trauma and culturally responsive programs; and Cultural Connectedness, which will include exploration of topics such as social justice principles, equity and decolonizing education. SHI will release more information in the coming weeks.